Beautiful home decor-weight fabric I found while browsing at Modern Domestic – it’s from Skinny laMinx, a fabric designer based in South Africa. Her nature-inspired fabrics are amazing, and you can buy them on Etsy 🙂 The print that I used for the table runner and the tote bag is Pincushion, in colors Humbug and Khaki. I bought 1/4 meter of each (they’re pretty spendy, but the quality is really first-rate), even though I had no idea what I was going to do with them. After letting them sit on my sewing table for a few weeks, I decided on simple projects, to highlight the fabrics themselves. First, I sewed a very simple table runner (backing it in a heavier weight neutral) and paired it with these cafe bowls from Heath Ceramics in San Francisco. I then used all of the remaining yardage to make a tote bag, based on the Forty-Minute Tote pattern from Purl Bee. I altered the dimensions a little and made the straps a little longer, so that it’s the perfect size and fit to load up all of my goodies at the Portland Farmer’s Market every Saturday. Next, I used a fat quarter meter of Solid Orla Fog to make two boxy pouches, using this tutorial. It’s really well-done — especially in getting the details of sewing in zippers just right – and not at all complicated, but one word of advice: DON’T follow the tutorial when it comes to boxing the corners! The tutorial’s approach is very difficult – a much easier way to box corners is demonstrated on many of the Purl Bee’s tote bag project demonstrations, including the Forty-Minute Tote. I boxed each corner by sewing my line at the point where the corner is three inches wide. Then, to sew in the handle, I ripped out a few stitches in the middle of two of the exterior boxed corners, inserted each end of the handle, and sewed the corner back up. I used decor bond interfacing, along with the canvas weight fabric and cotton batting, so the pouches are very sturdy and hold their shape well. I quilted the fabric, interfacing, and batting together before I started sewing – I experimented with quilting one horizontally and one vertically, just to see how it would change their appearance. They are really cute – not that big, but the perfect size for make-up or sewing notions or tons of other things. The store is Starflower on SE Belmont in downtown Portland – just a little nook of a shop, but so many beautiful things to choose from! Inspired by a Pinterest posting, I visited Bolt and bought several yards of Robert Kaufman’s Essex Linen in color Flax (fronts of placemats) and one-half yard of each solid color in Andover Textured Solids (backs and binding). I raided my stash fabric for matching colored prints for the striping. I started by cutting rectangles of front and back fabrics approx 17″ x 21″, then I sliced up the front rectangles with uneven cuts, and improv pieced them together, then finish-cut them to 16″ x 20″. Next, I sandwiched batting between the fronts and backs and quilted with irregular vertical lines (to emphasize the improv and asymmetrical nature of the piecing). Finally, I cut 1 3/4″ strips of the back fabric and used those to bind each placemat. Luckily, I remembered to pre-wash all of the fabrics (a step I usually forget!) so that they can be regularly used – and washed. The idea is for these to be our “everyday” placemats, and everyone gets to choose a color. I think that they’ll really brighten up the dinner table! I spent the weekend sewing three of the projects on Purl Bee’s blog, all designed for use in the kitchen: an apron, dishtowels, and hot pads. What distinguished these projects, however, is the beautiful fabrics that came in the Purl Bee kits – linen for the apron, soft double cloth cotton for the dishtowels, and gorgeous, fuzzy oatmeal wool for the hot pads. It’s really true that working with high-quality fabrics makes all the difference! 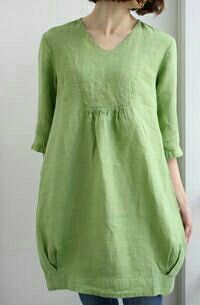 I didn’t add in the cotton twill loops for a dishtowel on the aprons, but otherwise, made no modifications to the pattern. 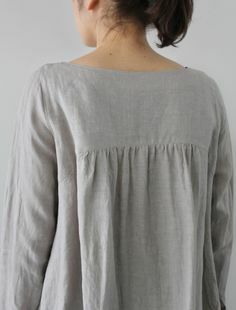 I didn’t wash the linen first – kind of wish I had, it’s really stiff right now, but I’m sure it will soften up beautifully once it’s been washed a few times. These truly are about the simplest sewing project ever, but what makes them so special is the wonderful double-sided / double-thickness cotton cloth – really beautiful! I hand-stitched six Xs on each hot pad to hold the lining in place, but I didn’t stitch on the wool side as the pattern called for – instead, I marked my Xs on both sides, and then ran the thread through all layers, from one side to the other, to form matching Xs on each side. Otherwise, I followed the pattern as written. I love projects like this – working with gorgeous fabrics, quick and (largely) mistake-free sewing, and a perfect gift package when you’re done! This project was a beautiful way to show off different stitch patterns and tonal color combinations, and it was also an ideal summer knitting project, because knitting with linen is much better than wool on hot days! I used the free Purl Bee patterns here and followed the instructions without modifications. The yarn is Louet’s Euroflax, and I chose the color kit with cream, natural, and pewter (although I loved the kit in the blues, too). I knit on US 3s, and was happy with the drape and density of the resulting fabric. Because knitting three of these got a little monotonous, I paced myself, setting a goal for a certain number of inches each day. It would have been a breeze to just knit one, but one’s the point of one dish towel? I liked all three patterns, but I think that the three-and-one tweed pattern is my favorite – which is ironic, because it’s the one I made a mistake on. Because of the repetition of the pattern without a break, you can really see where I got off course. Unfortunately, I didn’t notice until I was way too far along to be interested in frogging it back to the error row; it really bothered me for a while, and then I just decided, those little variations are the beauty of hand knits! Per the yarn instructions, I machine washed and dried the finished dish towels; it definitely softened up the yarn, although I’ll have to wash and dry them numerous times in order to really get a feel for how the fabric ultimately wears. Unfortunately, while the dryer softened the yarn nicely, it also tweaked the shape and made the sides curl, so I re-wet them and dried them on a blocking board. Nice-looking finish, but very rough! So, I guess you either get soft and shapeless, or rough-feeling perfect rectangles 🙂 The upside to the rough feeling, though, is that I think that they’ll dry a lot more effectively than many hand sewn dish towels I’ve made. My goal is to actually make myself use them – it’s hard to put to hard and dirty work something I’ve spent so much time and effort to make, but what’s the point of making beautiful things with thought and care, if they just end up sitting in the closet, waiting for a special occasion? I’m a big believer in the philosophy of using your “special” things every day, since it is the every days that, taken together, become the special times in life . 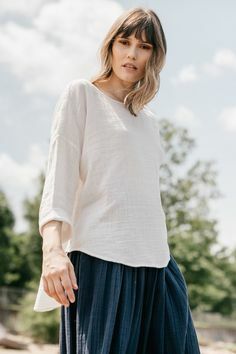 . .
Another beautiful project from Purl Bee – I love how their simple designs, when paired with such gorgeous fabrics, come out perfect every time! This sewing project is for tea towels, but Purl Bee’s attention to detail and the finishing touches really makes these stand out. The fabrics do, too – I used creamy porcelain Prairie Cloth as the base (a large gauge upholstery weight fabric with a handwoven feel), and Liberty of London Tana Lawn Seasonal (designs Pink Irma and Midnight Flora Eve) for the ends. I bought 1 1/2 yards of the Prairie Cloth, and was able to make five tea towels with very little left over; I bought 1/2 yard each of the two Liberty prints, and used up all of the Pink Irma, with enough Midnight Flora Eve leftover to have been able to make a sixth towel. I made all five tea towels in an afternoon, even after forcing myself to slow down and pay attention to the stitching detail – the instructions are spot-on, and the finished product comes out exactly as advertised. Love it! These will be a great addition to my gift closet – the perfect go-to gift for birthdays, housewarming, hostess, or any occasion. A quick and easy gift project – so easy, it feels like cheating! 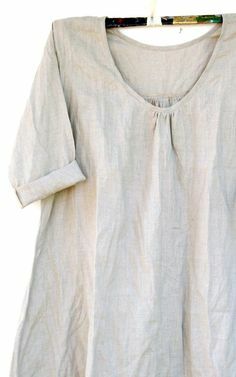 The fabric – called “dish towel fabric” – is already hemmed on the long sides, so it took only five minutes to do a rolled hem on each short edge. Done! I purchased the fabric at Bolt Fabric Boutique – an amazing custom fabric store on NE Alberta in downtown Portland – 1 1/2 yards made two dish towels. They had a wide variety of colors and patterns. A perfect last-minute gift, to be boxed with other kitchen accessories – quick and easy, but still with a handmade touch. A typical scenario for me – find fabric I love, order fabric, get fabric in the mail, have no idea whatsoever what to make with fabric . . . this time I decided to make a Christmas present for a friend and fellow chicken owner – I think this fabric is so bright and cheery, it would be perfect for the kitchen. The fabric is Metro Market by Robert Kaufman (licorice chickens and yellow chickens) and Lecien Dots (medium black), all 100% cotton. I ordered both online from Purl Soho in New York City. I started with double-sided placemats – for each placemat, I cut two pieces of the red chickens and two pieces of the yellow chickens (13” x 13 1/4” and 13” x 3 3/4”). Then for each placemat I cut two pieces of the black dots fabric (13” x 3”). I pieced together each side as shown, then sewed the two sides right side to right side, leaving a little opening to turn the finished piece right side out. I clipped the corners, turned the piece right side out, and carefully ironed it (pressing is very important here!) Then I top-stitched at 1/8” with a contrasting color thread around all four sides. Done! I decided not to put any interfacing or batting inside these placemats – I was afraid they’d end up feeling too flimsy, but I actually light the lightweight feel and they don’t seem too unsubstantial for placemats at all. Next up – dishcloths. These were even easier – I just cut one piece of each color of chicken fabric (22” x 22”) and rolled in a 1” hem on each side (1/2” then 1/2” again), pressed in the hem and sewed. The fabric worked well for this – there was no need to make it double-sided and the dishcloths still feel sturdy enough for their intended purpose. For the potholders I cut 8” squares (two squares of each color) and a little larger square for each of batting – put each of your squares wrong sides together, with the batting in the middle, and quilt together (I just freehand quilted a random design). Trim around the edges. Then I cut 1 1/2” strips of the black dots fabric and sewed those strips onto the edges just like binding a quilt (with a loop tucked into one corner). Finally, using a free tutorial on Purl Bee, I sewed a simple drawstring bag out of the red chickens fabric to hold all of the gifts inside. I saw these plates – I love the shape and the deep red color – at Crate & Barrel, so I paired them with the sewed projects for a complete gift package. Even though these sewing projects were really easy, they kind of pushed the envelope (sewing-wise) for me because I’m not very skilled at making up my own sewing patterns – I usually need an established pattern that I can follow exactly. I struggle to look at a sewed item (or conceptualize one) and figure out what sizes the unseamed component pieces should be cut, and how to sew it all together (and in what order) so that no seams are showing, etc. 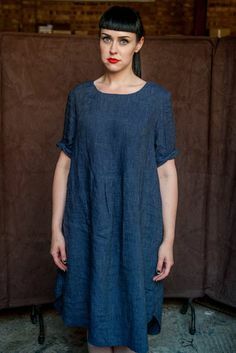 I think you almost have to be able to “see” three-dimensionally in your mind in order to do this – of course, it helps to have a lot of experience with sewing, too, because you can remember back to a similar project you’ve done in the past.